I finally finished school and all of my finals! last thursday was my last day at school, and i couldn't be more relieved! After finishing on thursday, i drove all the way home on friday and luckily i made it alive! its been so good to be home! it was a sad arrival though with no one there to greet me since my mom and brother are busy in india and thailand.. but at least the dogs and cat were excited to see me! i have loved the warm weather and being able to wear dresses and shorts without a jacket! boy, am i glad to be out of the snow! since i've been home, i've just been seeing friends and getting settled in, again. right now i'm in the OC visiting my sister and her family, and currently playing babysitter! but starting tomorrow, it's time to get my tan on! what??!! you drove home, but not colorado? now your excuse about driving here is definitely out the window. I always loved this coppertone baby. 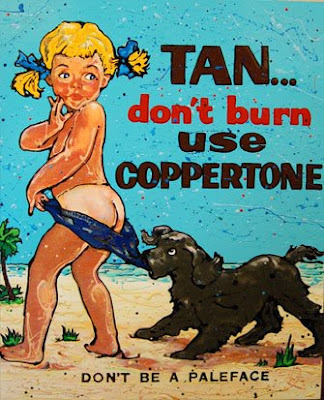 And you are the coppertone babe! glad you made it home safe, but i'm not so happy that you left. have a good time getting the tan on. i'm very jealous. So sorry there was no one to greet you! But at least you got out of winter and into the sun. Have fun in sunny CA!